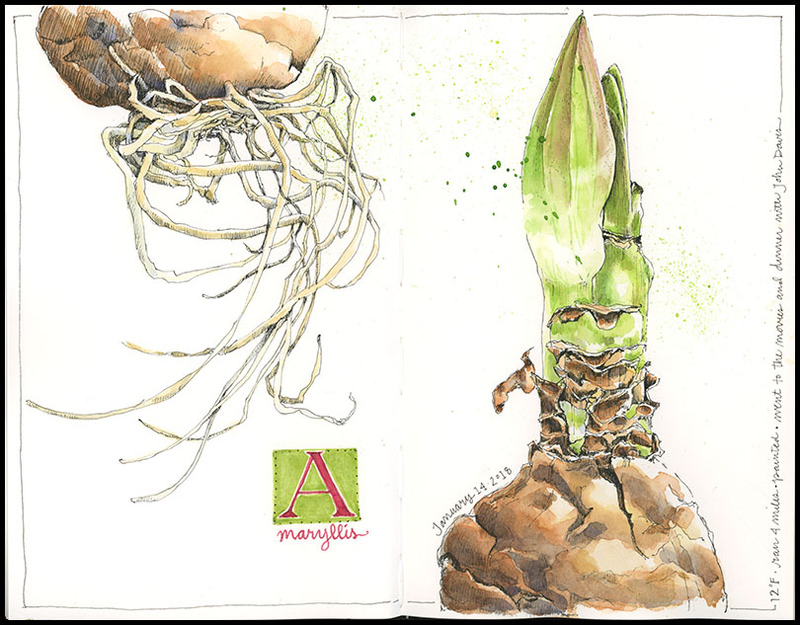 This entry was posted in Journal and tagged amaryllis, bulbs, ink, sketchbook, watercolor sketch by Jean Mackay / Drawn In. Bookmark the permalink. The power of leaving some white space! Your “confessions” remind me of the old lady who swallowed a fly. Just don’t go swallowing any spiders, that probably wouldn’t help….. Wonderful page, as always. Finding a new posting from you is like a little present. I thought of that rhyme too Melissa. Now I just have to get back to the house painting. But instead, I’m poking around the internet. Bad. Love your work! I operate in a similar way at times…..I call them “avoidance techniques”…lol…. Yep. I don’t do it often, but every now an then… I am nearly ready to wade back in to the pieces left on my desk. I love your drawings Jean – I keep practicing my drawing. I’m sure you’ll manage to get your commission done okay – you’ll just have to gradually creep back out on that limb…. ! Indeed. I really like drawing and find I have a sort of tug of war with painting and drawing. When I go too far on the painting side, I tend to swing back. Wow, this is a beautiful rendering. Thanks Sharon. I was pleased it came together so well with the split view. A really lovely painting, and a dignified way to avoid that commission! 😉 I’m partial to white amarylis, but they’re not as common as the red ones, so this year, once again, I think I missed the boat. I didn’t see any white ones so I didn’t get one. They are so wonderful to watch…enjoy! I’m curious about the white ones, too. In my research for this post I discovered that there are two distinct species sold as amaryllis– one from Africa and the other from So. America. The reds tend to be So. American Hippeastrum species…which is what I have. Maybe next year we’ll find the white! I took a quick look online and there seem to be plenty of bulbs around to order. Guess I need to make a note on my calendar…. 😉 I do love your drawing, and the way you balanced the roots on the left with the bud on the right, clever! Yesterday I saw individual tulips for sale that went stem to stern – i.e. root to flower. It was interesting, a good marketing ply, I think, I may get one! I like the idea of seeing the full flower, root to blossom. I wanted to plant my amaryllis in water so that I could see that, but didn’t have the right stones. Next time! It probably says something that I killed mine. I look forward to seeing the end result. Yikes…maybe you had a bad bulb…or did you drown it? I think I neglected it to the point of death. Apparently plants are too much of a commitment! Beautiful! Your drawing captures it.! What is it about bulbs? I love to just go to the farm supply and look at the bins full of them. It must be the mystery packed inside that intrigues us? I just started sketching some of late. But wow! Love this! So right Erica. I also like seeing the full plant…roots to flower, which we seldom do. It is a great opportunity to really look at a botanical specimen. Good luck with your sketches! Beautiful painting! Great tip too.